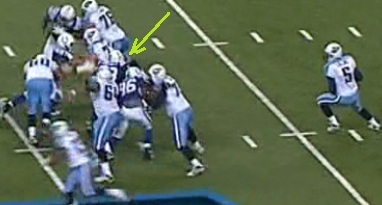 This is one of the plays that Freeney (circled) played at DT in the week 17 matchup against the Titans. The player to his right is Kenyatta Dawson number 96 and he is at Freeney's right defensive end position. 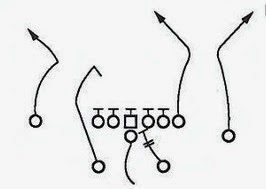 At the snap of the ball those two players execute a "twist" play where the RDE crashes down into the offensive left guard, hoping to take the left tackle with him. 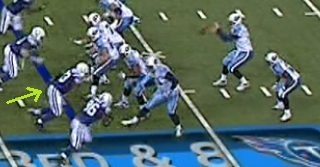 Freeney at RDT "twists" around to his right trying to loop around to the QB. Now the defensive line twist is nothing special in the NFL, you see it every week. The difference here is that you usually don't have a player with the explosive speed of Freeney coming from the inside to the outside looping around the offensive tackle - usually it is a slower defensive tackle. That had to have put this in to screw with whoever their first round opponent was going to be. Why else do it now? 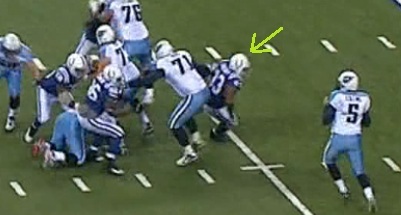 As we can see, Freeney was single blocked here by a guard with disastrous consequences for the offense. 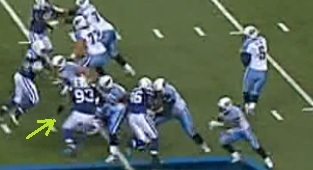 The left guard was completely unprepared for someone as fast and skilled as Freeney coming at him. Will we see this against the Jets? Probably. But at the very least the Jets will have to devote some of their preparation time to dealing with this eventuality - and getting the Jets to waste time on it is still a win for the Colts.